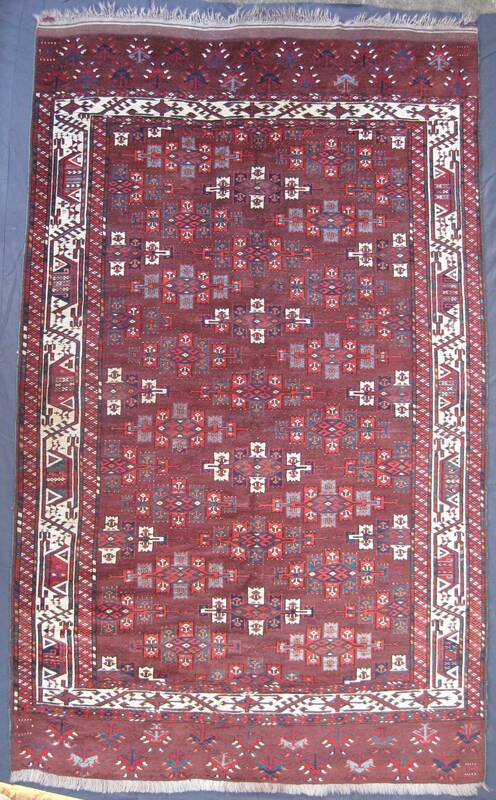 This main carpet with a kepse gul design was made by a member of the Yomut tribe in Turkmenistan in around 1880. Diagonal rows of kepse guls with a white element in every other diagonal are set within a meandering “boat border” on a white ground. At the top and bottom ends this “boat border” is a variation of the design on the sides. As pointed out in relation to a Tekke main carpet on this website, see https://www.christopherleggeorientalcarpets.com/products/view/antique-tekke-main-carpet/ ,main carpets played a very important role in the lives of tribal groupings within the different Turkoman tribes. The colours of Yomut main carpets are often quite dark and almost subdued, but in this piece we have a pleasing addition of a nice range of blues and a beautifully saturated lighter red. All colours are derived from natural dyes.